RANGERS made it four wins out of four against East Stirlingshire this season but today’s 4-2 victory at Ochilview was far from straight forward for the Champions. Robbie Crawford’s well-taken goal after just six minutes got them off to the best possible start but Paul Quinn’s penalty levelled the scoring before Shire’s number 9 Kevin Turner saw red for a poor challenge on Ian Black after 30 minutes. 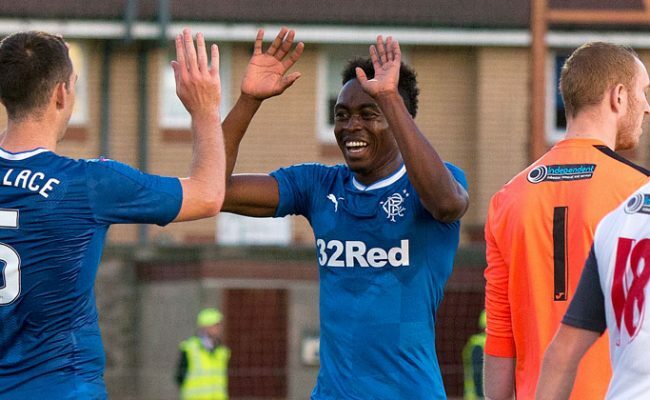 With an hour of the game left it looked as though Rangers would make the most of their advantage but to be fair to John Coughlin’s men they showed plenty of spirit before Rangers’ shifted through the gears towards the end of the second half. David Templeton’s free-kick before half time was a moment of class but again the home side never gave up and made it 2-2 on 50 minutes through Quinn’s header. 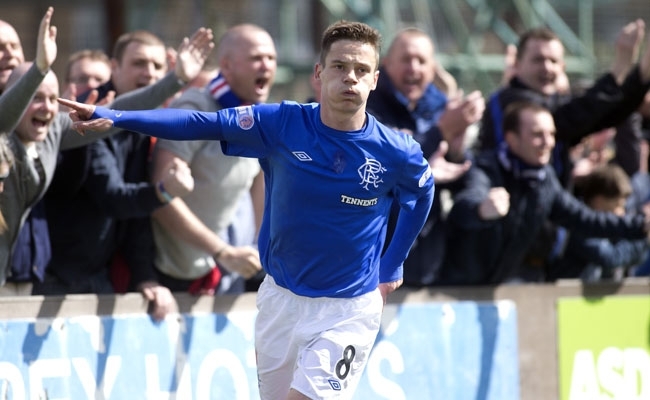 Rangers had to up the tempo and they did that with Ian Black finishing well with 65 minutes on the clock before Templeton again produced a calm and composed finish to complete the scoring at 4-2. With Lee Wallace out with a knee problem and Chris Hegarty ill, McCoist was forced to make three changes to his team with Emilson Cribari returning from injury to join Lee McCulloch in the centre of defence and Andy Mitchell slotting in at left back. With Fraser Aird dropping to the bench this allowed Kal Naismith and Crawford to come back into the side on the right and left wings respectively. The East Stirlingshire players produced a nice touch before kick-off when they held a guard of honour and applauded the Rangers players as they walked out on to the 3G surface while Queen’s ‘We Are The Champions’ blasted out of the PA system. The travelling Bears appreciated the gesture and it was not long before they were celebrating the opening goal. Naismith found a yard of space on the right wing and his low delivery to the front post was met by Crawford who clipped the ball into the net having made an excellent run across the defender. Having lost 6-2 to Rangers at Ochilview back in November the early signs weren’t good for the Shire but they regrouped with former Murray Park kid Max Wright on the left wing seeing a lot of the ball. Indeed it was his right foot cross which led to Shire’s equaliser on 22 minutes. Mitchell was judged to have pushed Turner in the back and referee Barry Cook immediately pointed to the spot. Mitchell was booked as a result and Quinn powered his spot kick straight down the middle of Neil Alexander’s goal with the keeper diving to his left. This certainly wasn’t in the script and on 30 minutes the game changed again when Turner was sent off. The striker appeared to stamp down on Black when going into a tackle and the official had no hesitation in pulling out his red card despite protests from the player’s teammates. Despite being a man down Shire continued to work hard and close down the Rangers players quickly but before half time the visitors got their noses back in front after a free-kick had been awarded 20 yards from Grant Hay’s goal. 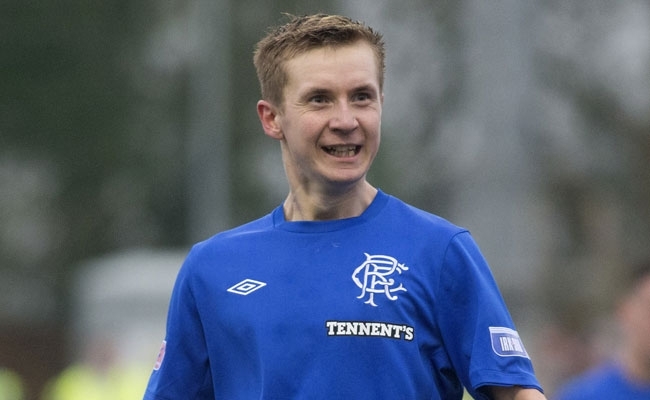 Templeton stepped up and his superbly executed effort curled around the wall before nestling in the net. Rangers were now in the driving seat but proceeded to shoot themselves in the foot on 49 minutes when the ten men made it 2-2. A good cross from Ricky Miller found Quinn in acres of space in between Faure and McCulloch and his header from six yards beat Alexander. Rangers were rattled and things could have got worse when centre half Chris Moffat met David Greenhill’s corner but his header went wide of target. 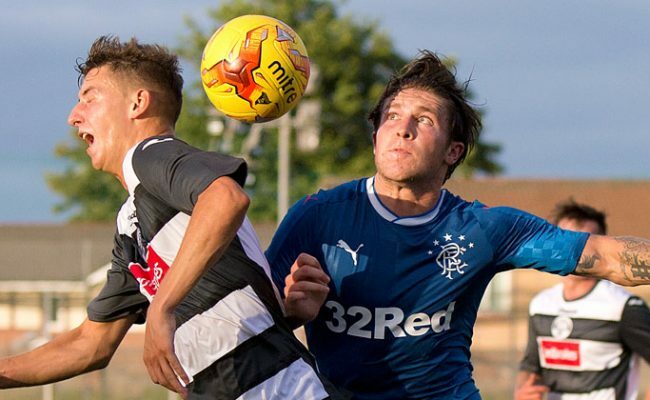 On 54 minutes McCoist made his first change with defender Luca Gasparotto replacing Kal Naismith, a move that allowed McCulloch to join Little in attack. Before the hour mark a header from the Ulsterman brought out a good save from Hay before a Mitchell free-kick from 25 yards fizzed past the post. On 65 minutes the third goal finally arrived and it followed good build-up play. Little’s clever flick found Black who had burst forward and his left foot shot across Hay crept into the bottom corner of the net. 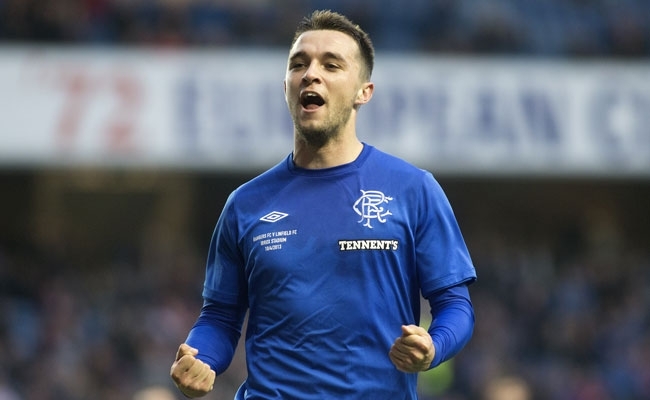 It was the midfielder’s second goal of the season and it could not have come at a better time with the Rangers supporters starting to voice their frustration. With 11 minutes left to play Templeton made it 4-2. Substitute Danny Stoney’s dangerous cross was missed by McCulloch but the ball fell to Templeton at the back post and he coolly found the net to make it 4-2 after a neat bit of skill had tricked a Shire defender.